“I made a vegan Nicoise salad with tofu instead of tuna!” I announced, proudly presenting the bowl. “I marinated the tofu in fish sauce.” I threw the bowl onto the dining room table and walked back into the kitchen, pouting. He was probably too nice to remind me that there were whole anchovies curled atop, too. So I guess there’s no hook to this salad. Not vegan, not even a vegetarian version of Nicoise Salad. I thought maybe substituting filler potatoes with superfood sweet potatoes would make this an Anti-Aging One Bowl Wonder, but then I should have kept the omega-3-rich tuna. Without tuna, haricot verts, capers, or potatoes, it actually bears little to no resemblance to the Provencal classic, so I guess in the end, it’s just its own little salad. Even if you never make this weird little salad, make the Fish Sauce Marinated Tofu (a piscine play on Real Food Daily‘s Gingered Tofu, so I guess there is a twist of some sort after all). The tofu is so awesome, it now has a permanent position on The Delicious Life List. 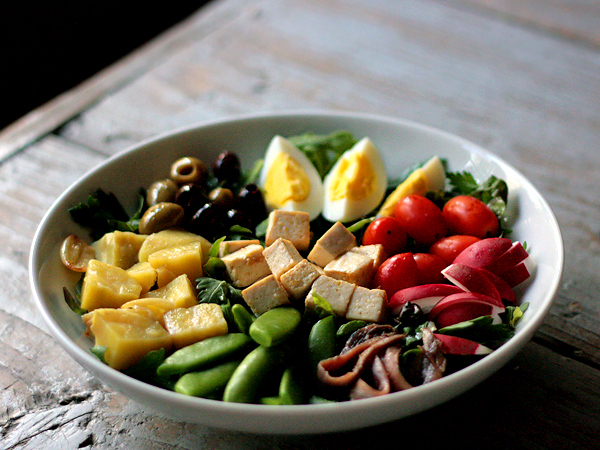 There isn’t a special dressing for this particular Nicoise-esque salad because there is quite a bit of flavor and salt from the tofu, anchovies, and olives. Just keep a little bit of extra olive oil, salt and pepper on the table when you serve it. Slice block of tofu in ½-inch-wide intervals. Pat dry the tofu slices with paper towels. Place a stack of 4-5 paper towels on a large rimmed baking sheet or tray. Place the tofu in a single layer on the paper towels. Place another stack of about 4-5 paper towels on top, place a flat cutting board or tray on top and allow the tofu to press and drain for about 1 hour. Remove the tofu from the marinade. Cut into cubes (for this recipes, though you can leave them as whole slices for other recipes). Heat a small amount of oil in a pan over medium heat. Add the tofu and fry until the tofu is golden brown on all sides. Remove from pan on drain on paper towels. In a large bowl, toss greens with olive oil and vinegar to coat the leaves. Place greens in serving bowl. 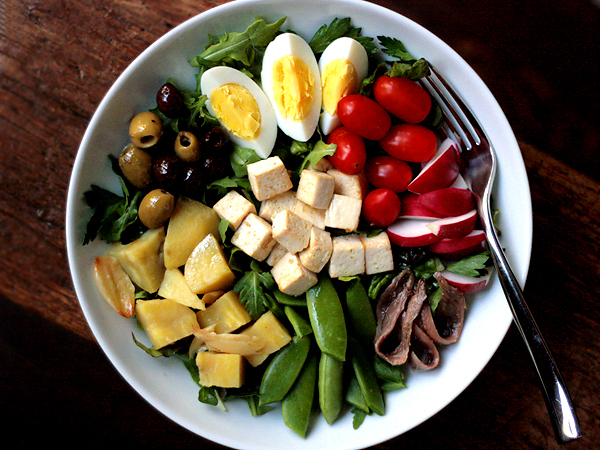 Arrange each of the salad components on top.